If your washing machine Bosch once gives an F21 error and doesn’t knock out the plugs at the same time, you are very lucky. Having seen this failure, immediately disconnect the Bosch washing machine from the mains. Only then call a specialist. Self-search for a problem solution, especially in a powered technique, increases the risk of electric shock. However, we will not intimidate you ahead of time, let’s deal with this error step-by-step. Error F21 in the Bosch washing machine may appear not only in the form of alpha-numeric code. Often it occurs as a set of blinking indicators on a control panel. This happens because some models of Bosch washing machines are not equipped with a display. Thus, the F21 code cannot be shown. You can distinguish dozens of errors using the system of flashing indicators. Specialists do it even without thinking as they have a lot of experience with such devices. A user can also perform this following a special table of error codes. In the picture below we prove how the F21 code is shown on the Bosch appliance without a display. The following stages happen. The washing machine freezes and stops responding to button presses. Then, it turns the program selector knob. Three light bulbs begin to flash or blink at the same time (1000 revolutions, 800 revolutions, and rinsing). If you have an older model of the washing machine, then the indicators of 800/600 revolutions and rinsing will turn on. Older devices perform spinning at eight hundred revolutions, the maximum. The error explanation is simple. But finding the reasons for its occurrence is quite complicated. Masters interpret the F21 error code the next way. There is no possibility to rotate the drum of the Bosch washing machine. In fact, the appliance tries to start the rotation several times. And if it does not succeed, the code F21 appears on the control panel. So what causes the code appearance? Why the washing machine can’t start the rotation of the drum? Tacho sensor is defective. A module doesn’t get information about the engine speed. So, it stops the Bosch washing machine and gives the F21 error code. The engine is out of order. If the motor is broken, it is not able to rotate. Accordingly, the module makes several attempts to start the engine. Then it issues the specified error. A chain which powers the motor or a Hall sensor (tacho sensor) is damaged. In this case, the sensor and the motor are in order, but their feeding wiring is broken or rather oxidized. The cause for the F21 error can be a foreign object. It often gets the tank during washing and hinders the drum. Another reason for F21 error code is a voltage drop in the mains. There are no universal recipes for troubleshooting. It’s necessary to start checking all the above reasons in a convenient order. Do it until you come across a breakdown. Let’s start with the Hall sensor. Most likely, you attempt to choose a different order, from simple to complicated. Of course, it is quite reasonable. For example, it’s a good idea to check the rotation of the drum for foreign objects first. Then check the voltage in the mains and only then get into the case to test the engine and the Hall sensor. Many users get troubles obtaining access to the tacho sensor and the motor of the Bosch washing machine. How to get to these details? Slowly turn off the device and pull it out somewhere, where is more space. Dismantle the rear wall of the washing machine body. Next, remove the transmission belt because it will hinder your work. Using your phone, take pictures of the wires and fasteners location in order not to mix it up later. Then remove the engine. If you want to quickly remove the motor from the Bosch washing machine, do the following. Firstly, disconnect the terminals from it. After this, unscrew the tightening bolts and press the body of the part. Slightly move it forward and pull down. The tacho sensor is located on the engine case, so remove it and carefully inspect. There may be marks of oxide and grease on the inner surface of the ring of the tacho-sensor. Remove it. Next, take the multimeter and check the Hall sensor. In case it turns out that the tachogenerator is burnt, you need to change the part immediately. The Bosch washing machine is often “marked” of serious engine issues. The problem with the brushes is the simplest thing that can happen to this part. Brushes on collector engines are erased quite often. So, their replacement for the master is a common thing. An amateur may have some troubles when dealing with brushes. But anyway this repair belongs to the category of easy breakages. So you will be able to fix it with your own hands. It will be much worse if the motor gives a leakage current to the housing. Or it has pierced several turns of the winding. 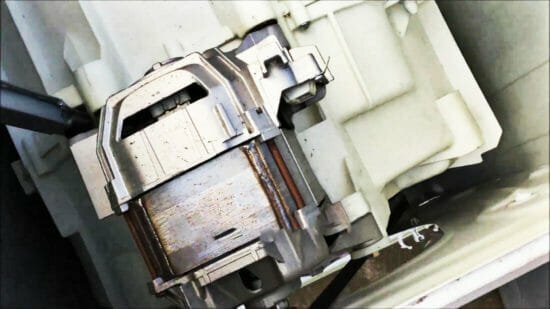 In 99% of cases, you will need to change the motor completely. At least, it will be cheaper than the restoration of an old engine. If there is no leakage, check each turn of the winding, trying to detect the rupture. The work is quite painstaking, but it will allow you to determine exactly whether the engine is in order or not. Before we proceed to other malfunctions that cause the F21 code, let’s discover how to reset the error of the Bosch washing machine. What is the reason to reset the failure if in the case of its elimination it disappears? It’s a common question. We’ll explain everything to you now. The point is that the error won’t disappear even if you perform the repair correctly. If you do not drop the settings, the code will still be here and hinder the start of the machine. How to reset an error of the Bosch washing machine? Turn the program selector to the off position. Turn the selector to the spin. At this stage, you need to wait until the error appears again on the control panel. Press and hold the button responsible for switching the revolutions of the drum. Hold it for a few seconds and then release. Turn the program selector to set the “drain” mode. Press on the button of turns switching again and wait some seconds. If all the lights blink and the machine is making the loud sound, the error is reset. But if nothing happens after you release the spin button for the last time, then you need to repeat the above-described actions. Some foreign object can cause the F21 error code in Bosch washers. It often gets into the tank, which is considered to be quite a common situation. It seems like masters have already extracted everything from the washing machines tanks. For example, coins, pins, bones from bras, buttons, small details from children’s toys, etc. All this stuff poses a danger for washing machine details. For example, there were some cases when sharp objects jammed between the tank and the drum. It led to piercing the tank and leakage. 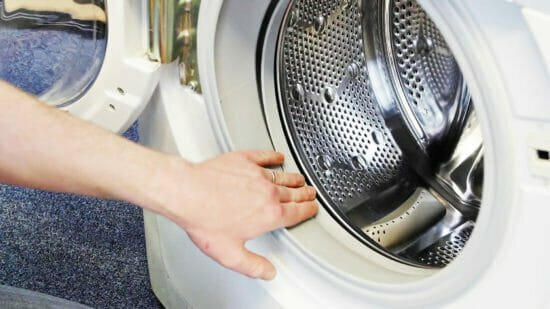 How to make sure that the drum jams the foreign object and don’t dismantle the washing machine? It is necessary to open the hatch door of the previously disconnected appliance. Try to turn the drum by hand. If you hear a metal rattle, and the part jams while spinning, then something has hit the tank. A foreign object must be immediately removed. If the Bosch washing machine refuses to work and shows the F21 code, it’s time to take radical measures. The fault may be caused by foreign object damage. In addition, it happens due to a strong voltage drop in the power grid. Otherwise, once such a drop can burn out all the electronics of the device. And it will exactly send your “helper” to the trash. To summarize, the F21 error code of the Bosch washing machine is a common problem. The fault’s reasons are diverse. We tried to describe the most common of them.